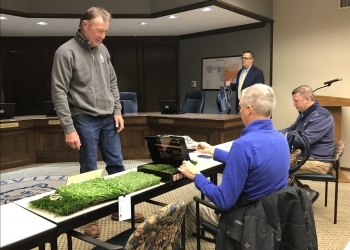 The Bartlesville School Board held a special meeting at the Education Service Center on Thursday morning to discuss bids for turf replacement. Among the several bidders wanting to replace the turf at Custer Field Stadium at Bartlesville High School, United Turf and Track from Edmond was awarded the bid in the amount of $425,000. Superintendent Chuck McCauley says they are fortunate that it didn't cost more because the Lyon Foundation helped with the original installment of turf at Custer Field Stadium in 2008. Their help with drainage and more at Custer Field Stadium led the Bartlesville School Board with the responsibility to maintain the field like they did today, McCauley says. He also would note that the investment in shock padding under the turf would be beneficial for their players as it would add much needed protection for them. United Turf and Track guaranteed a 25 year warranty for the shock pad. The board looked at about 5 ounces of turf per square foot in their decision which would add additional padding on top of the shock padding. The turf that will come to Custer Field Stadium has been used for Boone Pickens Stadium at Oklahoma State University and Gaylord Family Oklahoma Memorial Stadium at the University of Oklahoma. Turf removal could start Thursday or Friday. The board is looking for the installation to wrap up around Feb. 23 before Bruins soccer starts in early March. A $1,000 penalty might be enacted if the installation is not completed by then. Edmond Turf and Track says they could put up tents to help with turf removal and installation as changing winter weather conditions blow in. As for some design concepts, there will be more carolina blue than white in the field logos. There will be different shades of green every 10 yards on the field as well. Permanent soccer lines will go away with the new turf and will be painted on when soccer season rolls around. The paint, the board said Thursday, will flake off with the weather.